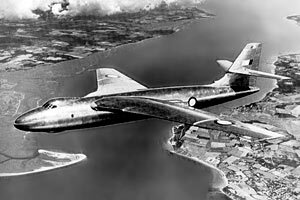 Designed in response to the same specification that also eventually produced the Avro Vulcan and Handley Page Victor, the Valiant had an uncertain start to life. 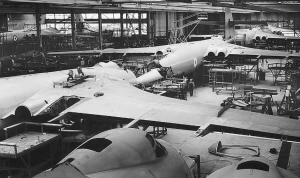 Vickers had been working on jet bomber designs since 1944 but with little interest from the government. With the end of the Second World War, however, interest in a jet bomber was reawakened. The B.35/46 specification issued by the Ministry of Supply called for a bomber capable of carrying a 10,000 lb bomb, travelling at 500 knots and at 50,000 ft, with a range of over 3,300 nautical miles. This was a substantial jump in capability over the piston-engine designs then current (though the U.S. was forging ahead with bombers equal to this capability). Vickers had a design that fell short of satisifying this specification and when Avro and Handley Page made submissions that satisfied it, the Vickers project looked doomed to be a paper aeroplane only. However, Vickers' chief designer, George Edwards, fought with the government for the chance to build the Vickers design, arguing that it was simpler and less likely to suffer failure or delay when compared with the riskier Avro and Handley Page designs. He succeeded, and the Vickers Type 660 was allowed to proceed, with a new specification being written around it (B.9/48) and issued in July 1948. Design work had really begun in April of that year and by February 1949 the Ministry of Supply ordered two prototypes. Two years later the Ministry felt confident enough to allow Vickers to proceed with the manufacture of 25 production aircraft; by April 1951 the order was official placed. The first type 660, WB210, flew on the 18th of May 1951, flown by Vickers' chief test pilot 'Mutt' Summers and 'Jock' Bryce. A conventional high wing design looking somewhat graceless compared to the Vulcan and Victor, it was however a clean design and from many angles appeared to be lacking any form of powerplant at all. The engines were actually four Rolls-Royce Avons buried in the wing roots; the intakes were thin slots in the leading edge of the wing. 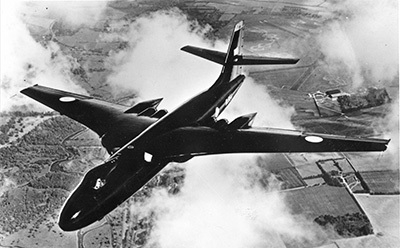 In June 1951 the name of Valiant was chosen for the new aircraft; the idea of having each of the new bombers given a name beginning with 'V' broke the long standing tradition of naming bombers after UK & Commonwealth cities - e.g. Lancaster and Halifax. The first prototype was lost in a crash on 12th January 1952. The flight was to measure cabin noise with the two inner engines shut down. After difficulties restarting the starboard inboard engine, unknown to the crew, fuel had pooled around the jet pipes. This fuel was ignited when the engine was successfully restarted (on the fourth attempt) and a fire spread to the wing structure via the flap area. The crew only became aware when control was beginning to be lost as no fire indicators were present in the areas on fire and the engine temperatures remained normal. Only the leading edge of the wing was visible from the cockpit and when fire was seen coming from this area it was clear they had a fire of catastrophic proportions and so the crew abandoned the aircraft, shortly before the wing exploded and the aircraft broke up. Crew escape, in common with the other two V-bombers, was a mixed affair. The two pilots had ejection seats (the canopy being blown off before ejection) but the rear crew had to bale out via the crew hatch on the port side of the nose. This was however substantially easier than on the Vulcan (no nose gear to hit) and the Victor (the Valiant crew door being much lower than the engine intakes). Unusually, the only casualty of this crash was the co-pilot, Squadron Leader Brian Foster (an RAF officer attached to Vickers for Valiant testing) - he struck the tailfin and received fatal injuries. The second prototype was nearly complete so the loss of WB210 was not as disastrous as it could have been. The second Valiant, WB215, first flew on the 11th of April and had enlarged engine intakes (necessary for the higher powered Avons fitted in this second aircraft) which were fitted with internal strakes to straighten the airflow into the engines as well as improved fire detection and suppression measures and relocated fuel vents. The new aircraft was designated the Type 667. 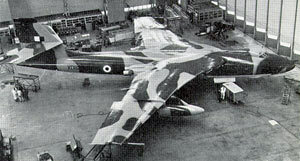 This would be the only noticeable change to the aircraft's shape during development; compare with the many changes in the Vulcan's design and the many modifications needed between the prototype Victor and production versions. The Air Staff decided that there could be a requirement for a 'target marking' variant of the Valiant. Applying World War II 'Pathfinder' tactics to an all-new nuclear bomber fleet that were all equipped with radar was a rather backward-looking bit of thinking, but nonetheless 17 were ordered (two being prototypes) and Vickers went ahead with the design for the Valiant B.2. This would have a much stronger airframe so it could cope with the low level flight necessary for the target marking role and higher performance engines as well. As the first production B.Mk.1 Valiants were being finished off, the B.Mk.2 prototype flew for the first time on the 4th of September, 1953 - by which time the Air Staff had cancelled the target marking requirement, and the order for 17 B.2s had already been cancelled - independently of the cancelled requirement - for financial reasons. Shown off at the Farnborough SBAC display days later, the aircraft had two major visible changes - the undercarriage was now located in big fairings underneath the wings instead of within the wing itself (enabling increased in-wing fuel capacity and a stronger wing) along with an extended nose to re-balance the aircraft now that the main undercarriage was further aft. By 1955, even though the Air Staff had realised that target marking was an outdated tactic and the new bombers would be quite capable of finding their targets in all weathers using radar, the cancellation of the B.2 Pathfinder variant gradually became apparent as a mistake. It was just beginning to be realised that high altitude penetration of Soviet airspace was going to be a lot more dangerous in the future. The sole B.2 continued as a flying testbed for a while but was eventually transported to Foulness in 1958 to be destroyed by having various weapons fired at it to assess the vulnerability of modern aircraft to gunfire. Changing the B.2's role from target marker to low level bomber would have been a simple affair, but it wasn't considered, and the end result would be a prematurely retired Valiant force. Also cancelled in 1955 was a civil airliner, the V-1000, that was loosely based on the Valiant design but with wings mounted low on the fuselage. The first prototype of the V-1000 was almost completed but the most likely British customer - BOAC - were intent on buying the Boeing 707 instead so the government saw little point in proceeding with an expensive airliner that had no immediate sales prospects. The cancellation of the V-1000 was a serious blow to both Vickers and the British taxpayer, and incurred a cost of £4 million - a huge amount of money at the time, for no benefit whatsoever. Yet another cancellation was that of the Blue Boar stand-off missile; this was to be used by the Valiant and trials were in progress when the cancellation order came. Meanwhile back in 1953, the first production Valiant B.1 had been completed; though 'production' is perhaps not the best term, as it was practically hand-built as were the the next four to be produced. In reality these first five aircraft were development aircraft; perhaps the Ministry of Supply thought that terming them as production aircraft would cause a little less embarassment for them - compared to the US and Russia, Britain was woefully behind in advanced bomber development. The Americans in particular already had the B-47 Stratojet in service by 1951. While the Valiant improved on the B-47 with a slightly heavier bomb load, higher ceiling, longer range and slightly smaller size, the B-47 was considerably faster (though the Valiant B.2 would have given it a run for its money) and, of course, several years ahead. While the US Strategic Air Command (SAC) operated the B-47, the RAF was operating Lincolns - basically an uprated Lancaster. The embarassment of having to borrow US B-29s in order to field a half-respectable bomber force was no doubt a big factor behind the production of no less than four advanced bombers simultaneously (along with the Valiant, Victor and Vulcan, Shorts produced two Sperrins, a simple design that never went into production once the Valiant proved successful). 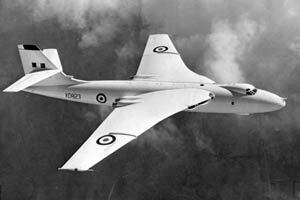 Also at this time Vickers made some modifications to the Valiant including long range fuel tanks under the wings with the hope of entering the New Zealand air race in October. However the Air Ministry vetoed this and English Electric's Canberra was left to win the race instead. The underwing tanks were not wasted though, and became a standard fitment on most Valiants. The first B.1s underwent trials while the first true production aircraft were finally on the production line. The first B.1s entered service with 232 Operational Conversion Unit at RAF Gaydon in June 1954. Gaydon had been a bomber training station in World War II and had been re-opened to be the first V-Force base. While the first Valiant crews were being trained the first operational squadron was formed; 138 Squadron. 138 moved to RAF Wittering and became fully operational in July 1955. Wittering had been home to the RAF's slowly increasing stockpile of nuclear weapons since 1953 and now finally the RAF had bombers and bombs in the same place. Development Valiants had only dropped bomb shapes though, not the real thing, so the V-Force was not truly in being at this point. The RAF had realised earlier that their new bombers would be ideal reconnaisance platforms as well, and accordingly an order was put through to produce 11 B(PR) Mk.1 variants - these could carry up to eight cameras in the bomb bay instead of a bomb load. The first deliveries of these were to the newly formed 543 Squadron at RAF Wyton in June 1955. Once B.1 and B(PR).1 production finished, another variant was produced, the B(PR)K.1. Similar to the B(PR).1 in that it could carry cameras or bombs, this variant could also carry a refuelling pack in the bomb bay, enabling it to act as an airborne tanker. In-flight refuelling was a relatively new innovation and had been trialled with Lincolns and Meteors; Vickers proved the Valiant was up to the job as well by using a modified B.1 with a cutaway bomb bay during 1955. The cutaway bomb bay was not necessary with the production K variants of the Valiant, however. In 1956 RAF Marham and RAF Honington were prepared for V-Force operations and five more Valiant squadrons were formed - 214, 207, 49, 148 and 7 Squadrons. The V-Force was rapidly becoming more powerful, and on 11th October 1956, a major change in the RAF's power came about. Flying at 35,000 ft over the Maralinga test range in Australia, Valiant B.1 WZ366 dropped a live Blue Danube nuclear bomb which detonated at 750 ft over an area of Australia known to the aboriginals as the 'Fields of Thunder'. The weapon produced a yield of 3 kilotons (equivalent to around 3 thousands tons of TNT); it had been intended to have a larger blast but in the end they played safe and went for a smaller one for this first UK air-drop. By the end of the month, Valiants were dropping bombs for real - but not nuclear ones thankfully. Egypt had announced its intention to nationalise the Suez Canal in July of that year, around the same time as a SAC B-47 crashed at a UK airfield starting a fire at what was allegedly a nuclear weapons storage facility. While the possibility of a nuclear disaster barely made the news, Egypt wasn't about to be as discreet as the USAF. Egypt had gone ahead and taken control of the Suez canal and Israeli forces were busy engaging the Egyptians. An Anglo-French operation to retake the canal and restore order was to be undertaken. While Wyverns, Sea Venoms and Sea Hawks of the FAA and Venoms and Hunters of the RAF attacked tactical targets, the RAF's top brass had decided this was a valuable opportunity to test out their new strategic bombers. Accordingly, Valiants of 138, 148, 207 and 214 squadrons were deployed to RAF Luqa in Malta and the first Valiant attacks against Egyptian airfields began on 31st October. Even with prior warning (to keep casualties to a minimum), Egyptian forces put up almost no resistance. The first Valiant to bomb, B.1 XD814 of 148 Squadron, was treated to a brightly lit target, no fighter resistance and ineffective anti-aircraft fire. This experience would be repeated for the rest of the Valiant attacks during the Suez operations; only one Egyptian fighter was ever sighted and made an unsuccessful attack on a Valiant which managed to evade the Meteor with relative ease. Once UK and French forces had landed in the canal zone the Valiant squadrons were recalled to the UK and by early 1957 none remained in Malta. Valiant production ceased in 1957 with just over one hundred examples produced (compare with over 2,000 B-47s produced in the US). The next big step in the upgrading of the V-Force's offensive capability also took place in 1957. 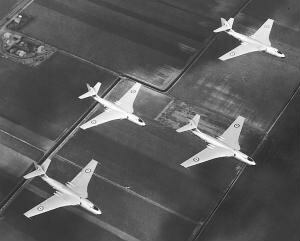 In March 1957, four 49 Squadron Valiants were detached to Christmas Island in the Pacific. On the 15th of May, Valiant B.1 XD818 released a prototype hydrogen bomb at 39,000 ft over Malden Island. 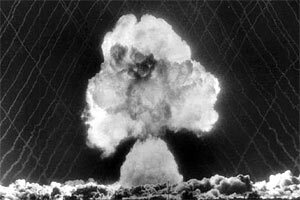 At 15,000 ft the weapon detonated, but it underperformed badly, producing only around a third of the expected megaton (million tons of TNT). Another drop later in the year would see a yield of 1.8 megatons, and 1958 brought yields of 3 megatons. The V-Force finally had the kind of nuclear weapon that both the USA and the USSR had had for the past two years. Now that the point had been proved and the UK could produce nuclear weapons just like the US and USSR, further tests and development of nuclear weapons were carried out in cooperation with the Americans and the V-Force would become part of the integrated NATO nuclear force. 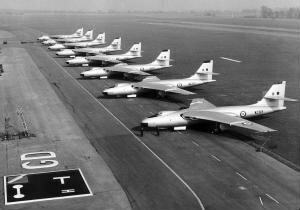 While Bomber Command's Development Unit pioneered the V-Force techniques of mass scrambles and rapid starts with the Valiant, the Valiant also helped with development of a programme not generally associated with the aircraft - Blue Steel. A stand-off nuclear missile designed for use with the Victor and Vulcan, Blue Steel was not to be carried by the Valiant in a rare example of officialdom having a bit of sense and not trying to have the entire V-Force have all of it's capabilities available in triplicate. The Valiant did however carry 2/5 scale versions of the Blue Steel and dropped them to test the aerodynamic properties of the missile. These smaller versions were not just dumb models but included a rocket engine so were used not only in Blue Steel development but also to give crews a taste of what firing the real thing would be like. When the full-size weapon was available a Vulcan took over the testing role, to be joined by more Vulcans and Victors later on. Late 1957 brought a change in colour scheme for the Valiant force. Initially in overall silver, the Valiants had been painted anti-flash white shortly after introduction into service but serials were in black and full colour roundels were used. Someone finally twigged that a nuclear flash might then burn neat roundel and serial shaped holes in the aircraft and the roundels were painted in a much lighter shade, with serials applied in the light blue used in the roundels. With the Victors and Vulcans now beginning to become operational as well, it might have made some sense to begin retiring the inferior Valiants and produce more of the other two bombers but instead the Valiant continued to form the backbone of the V-Force for several more years. 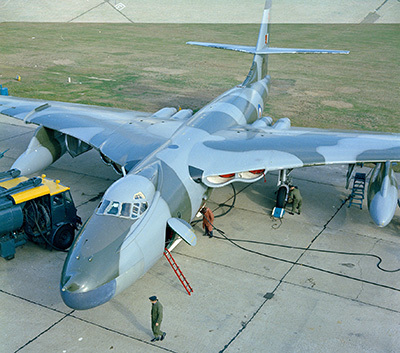 In 1960 the tanker variants were actually beginning to be used as tankers after two to three years of utilisation purely as bombers. 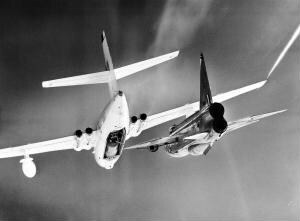 In-flight refuelling proved a huge success and soon the Valiants were highly valued for their tanker capability. By 1962 the Air Staff had belatedly come to the realisation that Soviet air defences were somewhat more impressive than those of Egypt, and MiG-17s and SAM-2s would make mincemeat of any Valiants attempting to penetrate the Soviet Union at high or medium altitude. The Valiant was switched to low-level tactical operations in 1962/3 and then given appropriate camouflage in 1964, covering the upper surfaces and fuselage sides. The Victor and Vulcan would continue in the strategic and tactical nuclear roles, also now at low level. Suddenly the Mk.1 Valiants were performing in a regime that only the Mk.2 had ever been designed to cope with. While the more advanced Victor and Vulcan took the role change in their stride, the Valiant fleet quietly deteriorated in the harsher conditions of the turbulent low-level air. However, nobody knew this at the time. 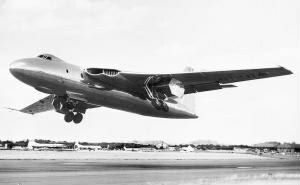 One Valiant, WP199, the first production example, was loaned to BSEL as an engine testbed for the P.1127 (Harrier forerunner) programme - a Pegasus engine complete with rotating exhausts was mounted in the bomb bay. It wasn't an entirely representative installation, as the intake was totally unlike the configuration that would be used on the P.1127, but provided some useful airborne engine handling experience for the project. On the 6th of August 1964, the crew of WP217 of 232 OCU felt what appeared to be a large impact when flying a training mission. With multiple warnings indicated, the crew elected to try and land their stricken aircraft. Incredibly, with the starboard wing's rear spar seriously fractured (so much so that the wing was noticeably sagging), a successful landing was made. The RAF and Vickers had already begun inspecting Valiant spars before this incident, after Vickers had found fractures in Viscount spars (made from the same alloy). After the WP217 incident an emergency spar inspection programme was put into place and the enormity of the problem was soon apparent - the majority of Valiants had significant stress fractures. Low level operations ceased immediately and other operations were seriously restricted while the cost of repairing or replacing the fatigued spars was looked into. With two other V-Force bomber types performing well, the cost of refurbishing the Valiant fleet was simply too high, and the Valiant force was grounded completely in early December. The entire fleet was retired in short order, with the OCU being first to disband and the last Valiant squadron, 49 Squadron, being disbanded in January 1965. The RAF was suddenly without its tanker force and Victors were hurriedly pressed into service in this role to replace the lost Valiants. Of the Valiants, most were scrapped at their bases very quickly after the disbanding of their operating squadrons. Others became fire training airframes, being burnt quickly, or 'damage to aircraft' targets. Several remained in flying condition, being on loan to what was now the British Aircraft Corporation (incorporating Vickers) for various flight test purposes. A single example was earmarked for preservation, and was appropriately enough XD818 - the Valiant that dropped the UK's first hydrogen bomb. Once BAC had finished with their four Valiants, they were stored for a while and then finally scrapped, though not before one of them, XD816, had taken part in the flypast on the 29th of April 1968 to mark the disbandment of RAF Bomber Command (which was now becoming Strike Command). The final remaining Valiant, XD818, stood guard at RAF Marham for many years before being moved to the RAF Museum at Hendon. More recently it has been moved once again, to its permanent home in the National Cold War Exhibition at the RAF Museum at Cosford. Five - pilot, copilot, tactical navigator, radar operator and air electronics officer.
? 54,000 ft (16,460 m) ? 114 ft 4 in (34.85 m) ? 2,362 sq ft (219.43 sq m) ? 32 ft 2 in (9.80 m) ?